The BEST baked Macaroni & Cheese EVER. 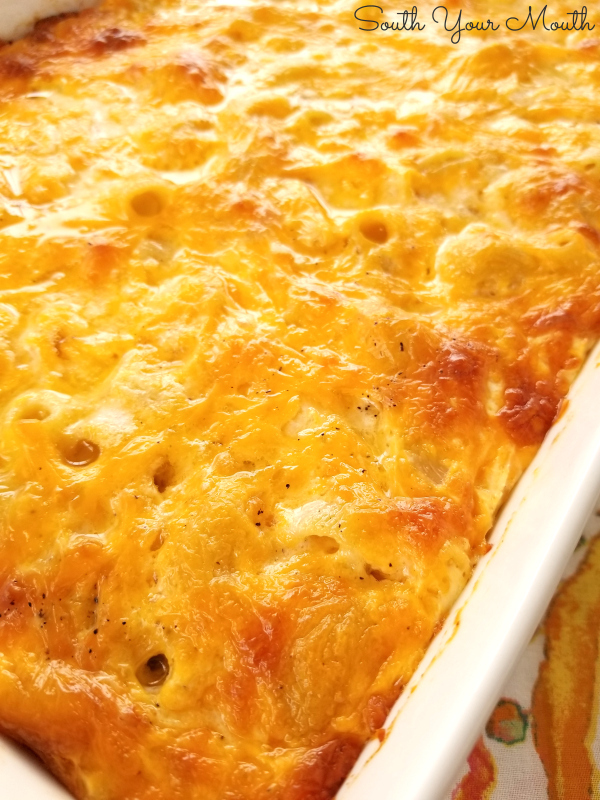 A custard-style recipe for baked Mac & Cheese using eggs and evaporated milk. Nanny’s Macaroni & Cheese was, hands-down, my absolute favorite of all the things she cooked. Though her 12-layer banana cake, chicken n’ dumplings and greasy rice all hold special places in my heart, there was nothing – and I mean NOTHING – that was more delicious or more requested than her macaroni and cheese. 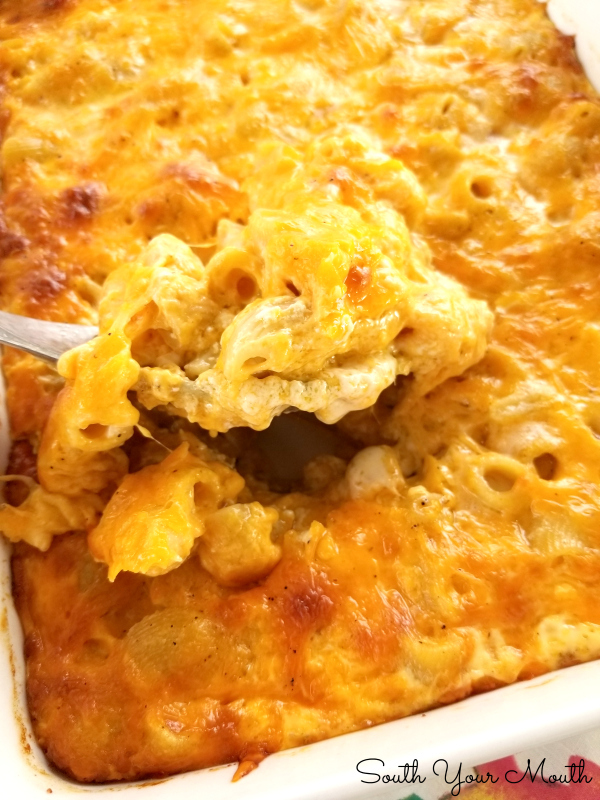 Let me just slide in a quick note here… I’m talking about the baked custard-style macaroni and cheese (sometimes called “macaroni pie”) that we make here in my part of the South, not stove-top or the kind made using a roux or béchamel sauce. When I got a little age on me and started helping out in her kitchen (cooking, that is, not my default position as the rinser and dryer in the two-man dishwashing operation my cousin, Lisa, and I were stationed at from the time we were old enough to reach the sink) I really paid attention to how she made it. Because when I grew up I knew I wanted to cook it just like her! So when I grew up, I made it like hers! And it was good. But it wasn’t Nanny’s. I always did everything the same except, instead of using canned evaporated milk, I used half and half or a combo of milk and cream. Because Ms. Fancy-Pants Chef Extraordinaire here thought she knew better than to use stinky ol’ canned milk. I’m a professional! I shall use superior ingredients! A few weeks ago I ran across this article from Serious Eats (THE BEST website for recipe technique) about how using evaporated milk is essential for making smooth cheese sauces and then I had a macaroni and cheese EPIPHANY. It suddenly all made sense. Definitely read the article (and the ones linked in it) for the details but, in a nutshell, what they will tell you is that for a velvety smooth and ultra-creamy cheese sauce, you need evaporated milk because of the high volume of milk proteins which adds stability to cheesy sauces. I’m sorry, Nanny!! You were right! And I was wrong! I’ll never question your recipes again! 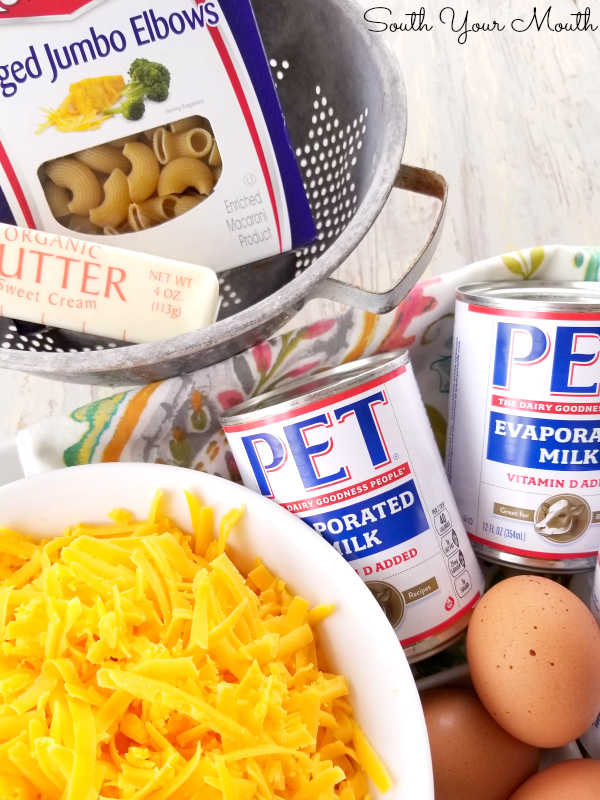 Our grandmamas probably didn’t know any of the science that went into it and were simply using the ingredients they were accustomed to cooking with having grown up during the Great Depression and/or World Wars but that canned evaporated milk is THE secret ingredient to rich, velvety smooth macaroni and cheese! Many of you never stopped using it and are rolling your eyes and shaking your head at me for thinking I knew better. I know, sista. I know. A few weeks ago we went to our friends’ house for barbeque and I volunteered to bring Macaroni & Cheese. Of course, now that I knew what I needed to do differently, I made it with evaporated milk. And it was glorious. I have never EVER received so many compliments on my macaroni and cheese as I did that night. Even after it was cold and hard and had been sitting out, people were still going back to the table to get more. So allow me to present to you my NEW (actually old) recipe for THE BEST macaroni and cheese EVER! 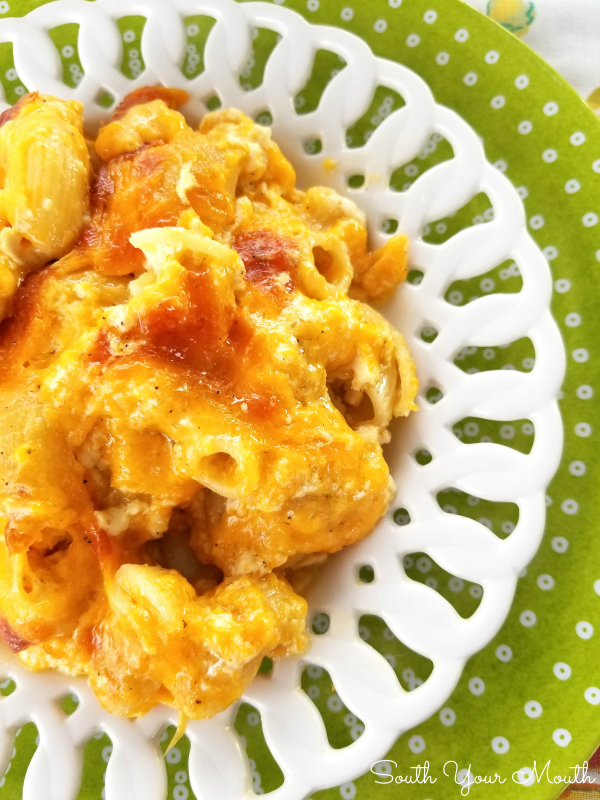 Also check out my recipe for CROCK POT Mac & Cheese! Cook noodles in liberally salted water one minute less than the package instructions for al dente preparation. Drain noodles then set aside. While noodles are cooking, shred cheese, reserving two cups of cheese for the top layer. Combine evaporated milk, eggs, salt, pepper, mustard powder and cayenne pepper in a large bowl and mix thoroughly (make sure the eggs are well combined into the mixture). Spray a 3-quart 13x9 baking dish with cooking spray (or rub with butter). Layer noodles and cheese into the dish, topping everything with the reserved two cups of cheese. Pour milk mixture evenly over noodles and cheese. Cut butter into thin pats then place them evenly on top of cheese. Bake, uncovered for 40-45 minutes at 350 degrees or until cheese is lightly browned and dish is bubbly. Remove from oven then let rest 30 minutes before serving. Don't skip this step... if you dig into this right out of the oven the inside will be soupy. The dish needs time to "set up". I prefer the jumbo macaroni noodles but I can’t always find them (when I can’t I often use ziti or cavatappi). Use regular macaroni, jumbo macaroni, or whichever noodles you prefer best! We’re undercooking our noodles just a smidge so they will hold up during the baking process. You absolutely MUST shred your own cheese. Pre-shredded cheese is coated with anti-clumping agents like cellulose (which is actually powdered wood pulp) which dries out your finished cooked dishes. It is also harder than cheese you shred yourself so it doesn’t melt as smooth and creamy. And it doesn’t taste as good. Just trust me here… buy a $10 box grater from Wal-Mart and shred your own cheese. It only takes a couple minutes! You can use a combination of cheddar and other soft cheeses if you prefer – just make sure the majority of the cheese is cheddar. I usually don’t use sharp cheddar as it’s firmer and doesn’t melt as smoothly. If you want to add some Velveeta to your cheese go for it. Some people swear by it and others spit on the floor at the mention of it. If you do use Velveeta, reduce the salt to 1 teaspoon. I actually add 1/4 teaspoon of white pepper to mine but I’m sure Nanny never did so I didn’t include it in the recipe above. You can easily reduce this recipe. Just use one egg for each can of milk and adjust everything else accordingly. This recipe was featured at the Weekend Potluck! I'm going to make this right now. Evaporated milk hmmm, never used that before. My Daughter coming to dinner, I wonder if she will notice the difference. Made this at Thanksgiving and it was delicious!!!! I also used extra cheese! Better than your "other" mac & cheese?! Macaroni and cheese is the ultimate comfort food for me. And it's gotta be homemade :) I can't wait to try your recipe. Thanks for posting it! This macaroni and cheese looks divine. I need to make it for my ladies group mosaic party I'm having in a couple of months. Thanks for sharing her recipe. I WISH I knew how to make that cake! It probably had more than 12 layers but I pulled a number out of my head. That sucker was ugly though. She made a cooked glaze to pour over each layer and, well, you know what happens to bananas when they get heated. Lord, that cake was so delicious though! You could almost drink it! I've been searching for (the best ever!) macaroni and cheese w/o a roux, using a custard instead. I can't wait to try this! Me too! Just popped it in the oven. My niece in Virginia makes her mac & cheese this way. Very good taste. But the night she misread the label and used sweetened condensed milk, my brother said it tasted like dessert for dinner. She won't be allowed to forget that one. I use a roux based cheese sauce for my mac & cheese. 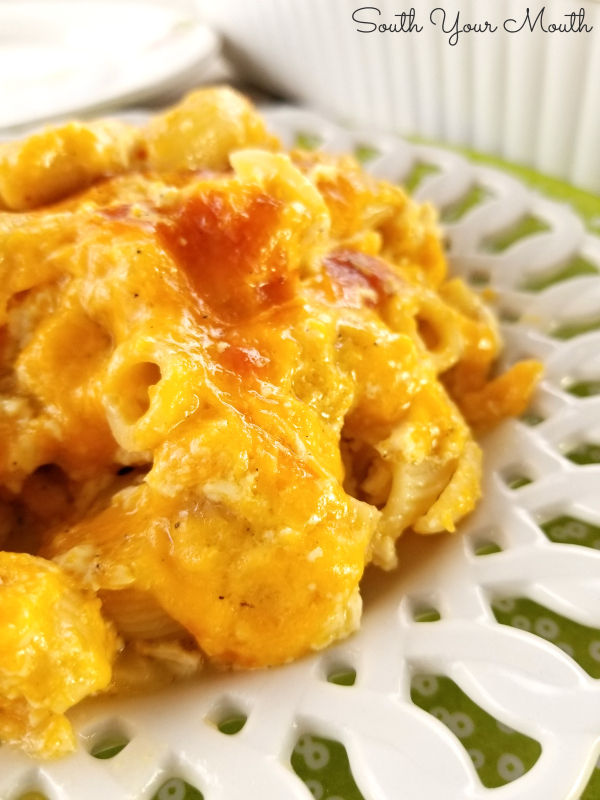 My husband has been waiting patiently for me to discover this recipe...being born of southern parents, he was never happy with my California ways with Macaroni and Cheese. He thanks you! Just a question...Can I use a mix of white cheese and cheddar cheese? Reason why is cheddar cheese has sooo much oil. I feel like I need to dab it with a napkin before eating. Absolutely! I have found that mild cheddar is less oily (no idea if that's true but it seems to be my observation). If I spend an extra buck and buy the "expensive" cheese, I don't notice any oil. This is exactly how I make mine!!! This sounds yummy! I've been wanting to try a crock pot macaroni and cheese for a while now. Pinning! My mom always made her Mac and Cheese with eggs and it was the best I have ever eaten. The eggs make it taste so rich. Welllll.... I guess I'm confused too... This isn't called crock pot, this is a recipe for my baked Southern-Style Macaroni and Cheese. There is one image above with a link to my crock pot recipe... maybe that's where the confusion in coming from? I made this Mac and cheese tonight and it was a huge hit! I halted the recipe and there was still plenty My first time making Mac & cheese with eggs;it was yummy! Thanks for sharing this one. I'm so happy to hear that! What kind of cheddar cheese did you use in this recipe, since you say you don't use sharp. You are welcome! So glad you enjoyed it! 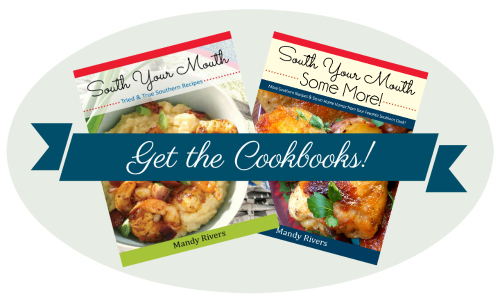 Mandy, LOVE,LOVE,LOVE your recipes!! Canned milk, now that's true southern. Two questions, can left overs be reheated, if so how do you reheat? Can it be frozen? Not sure because of the eggs. Just my husband and me now, but I still try to keep our southern roots alive. Thanks for any info and for your wonderful blog. Thank you!! I always just heat it up in the microwave! I have no idea about freezing it but the recipe can be easily reduced if needed! I realize this is a very late response but I have frozen this recipe and it defrosts and reheats great. I like to put it in the toaster oven so that the top gets crispy again. Yum! I made this as part of our supper tonight, but with a few tweaks (Due to milk and cheese availability in the house). I decided to go ahead and make a reaux because I only had two cans of evaporated milk on hand. After I added some seasonings while making the reaux - salt, pepper, garlic powder, onion powder, paprika, and nutmeg. Then added the milks and cheeses, heated through until the cheese melted. In a smaller bowl, I whipped the eggs and tempered them with the sauce before adding them to the big bowl of sauce, mixed thoroughly. Poured the sauce over my drained pasta that I put back in the pot they cooked in, stirred well to coat, and then poured everything into my prepared 9” x13” pan. Baked at 350*F (40 tp 45 minutes), pulled it out, added shredded cheese on top, and baked another 10 minutes to melt/brown up the cheese. My husband of 32 years LOVED this dish!!! I have been trying for years to convert him from the nasty boxed stuff, and I think I just succeeded! lol Thanks for sharing your recipe, Mandy! It caught my attention because it looked easy, even though I added some steps, it still WAS! I made this for my son and sent it to his house frozen. He just called to ask me to add to my rotation. He thought it would be perfect if I threw some ham in it. Anyone done that yet? Can this be assembled ahead of time and refridgerated? Yes! Though, I don't pour the egg/milk mixture over mine until I'm ready to bake it. You don't want the noodles to get mushy. Mandy, I need advice. I just assembled the recipe for Thanksgiving but did not bake it yet. Now that I’m reading this I’m a bit nervous. Should I just go ahead and at least partially bake it so that the noodles don’t get too mushy and then do a quick reheat on Thurs? Thanks! I am southern and so proud of it, but my grandma's never made us mac and cheese (if they didn't grow it or raise it, we didn't eat it, so it was probably a cheese thing). However, I had this version of it (custard) at a friends house (also Southern, bless her heart), and I was done... how in the world have I been eating all of those roux based M&C's (not a fan) and not known about the custard style M&C? Since then, I have been searching for years (because also, my Southern friend wouldn't tell me how she made hers! ), but it was never quite right. Now, you have revealed the secret! Canned Milk!! I am head over heels in love w/this recipe! thank you! Well, if it makes you feel any better, I KNEW about the canned milk but didn't use it until I read the Serious Eats article/recipe! And you're right, it is THE SECRET!! I'm so glad you enjoyed the recipe!! JENN!! You just made my day! I'm SO happy that you enjoyed it!! My task this year is to make the MAC and Cheese and I'm terrified! My mom is the best cook/ southern cook in the family and the pressures on. This sounds the closet to my moms recipe but I would need to double it, maybe even triple it because we have a big family... more like 2 or 3 pounds of noodle... so you said 1 egg per can on evap, per pound? Now I'm even more confused? That note was more so for folks who wanted to reduce the size of the recipe. If you need to double or triple, just double or triple all the ingredients. Good luck! YOU GOT THIS! Mandy, I made this receip several months ago and it was delicious. I forgot to add the butter but it was still awesome. Two people even asked me for the recipe. Now I’m looking to make it again for Thanksgiving but I’m afraid to add the butter since it went over so well before. It was not dry at all and I’m thinking that with the melted cheese it might be a little greasy with butter. Have you tried it without butter or with a smaller amount? Thank you....this is going on my thanksgiving table....I can't wait...reminds me of my mom mom's mac and cheese! If you wanted to use Velveeta in this, how much would you recommend? It's entirely up to you! I'd probably add 8 oz or so if I were going to add it. It can't be TOO cheesy! My layering method didn’t work...Cheese was not mixed within the noodles after cooking. Good taste though. my cheese was not completely mixed also. Next time I will blend the cheese with pasta in a bowl and then put into baking pan and pour egg mixture on top. Sorry but this dish was an epic fail for me. I’m use to using a rue or cheddar cheese soup. Your pics looked so yummy and the reviews were all so amazing. I followed the directions to a “t” except for combining everything in a large bowl minus a cup of cheese for the top. It was way to dry for our liking. Not use to Mac n cheese you can cut in squares. After having many post-Thanksgiving meal hours to think about it my conclusion is that 3 eggs was just too much. I’m not a real confident cook but my ebrows did go up when I saw that it required 3 eggs. You should read everything above the first picture where she explains very clearly this is nothing like a roux based mac and cheese. This recipe is the best I've ever used and I will ONLY use this one now. Made this for Thanksgiving and it was awesome. I did add a small block of Gruyere cheese and some crumbled Ritz and butter on top in addition to the butter in the recipe! Just the way I like it, thick and not creamy but just creamy enough when good and hot! Thank you for a great recipe! I am so glad I ran across this recipe. I could not remember how my mom made her mac and cheese, but I did remember that she used evaporated milk. Your blog made me giggle because I too thought of canned milk as inferior. I made if for Thanksgiving, but I think 2 lbs of cheese and a deeper dish whould make it perfect. I forgot to mention that my mom passed away in 2007, so I can't pick up the phone to ask her about it. I made this hoping to replicate my nana's family recipe, but it turned out kind of sweet. I definitely used evaporated milk so thinking it might have just been the store brand I bought that gave it that sweetness? Either way, I'm getting ready to make it again for Christmas and am wondering if anyone has had luck substituting 1 or 2 of the cans of milk for half & half / milk or something similar? SOLVED: Used Carnation Evaporated Milk instead of the store brand I bought earlier. Such a difference that made. 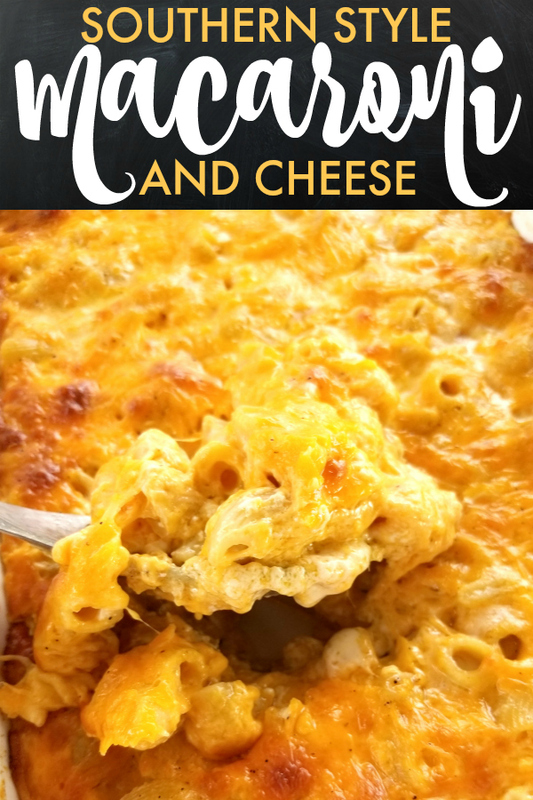 I was on the fence at first, but this is now my go-to mac & cheese recipe! I used a combo of Tillamook Extra Sharp & Tillamook Medium Cheddar for the traditional holiday meal, but might play around with some fancier cheeses for meals that aren't built around nostalgia. Thank you so much for this recipe!! I had no idea but when I asked some folks about why you might have had that result I was told some brands of evaporated milk are a bit sweet! And I was told that if you've never cooked with evaporated milk, it might seem sweet to you at first. I'm glad it worked out for you! Hi what’s a good brand of cheese to use for this recipe? I have made this a few times now, and both the Walmart Great Value brand and the Publix store brand have been delicious and melted nicely. 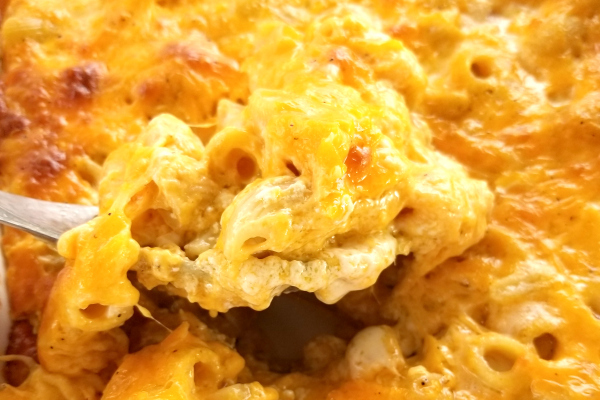 I used mild cheddar and grated the blocks of cheese instead of using pre-shredded :) We also love melting about 4-6 ounces of Velveeta, then mixing that in with the hot noodles before mixing in the other cheese and topping with the egg mixture ;) This also freezes and thaws wonderfully!! Instead of a the Mason & Dixon Line, they should use the evaporated milk/egg vs. roux (nasty flour based Mac and Morney uppity yankee sauce) distinction. 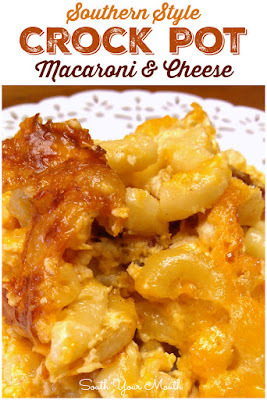 My favorite macaroni and cheese recipe! However, I want to make it using sharp, Monterey,and extra sharp cheedar. Do yuo think it will work out?